I am also so delighted that Compass Medical Waste Services can bless iThemba Lethu with this financial donation especially in light of my pending adoption this year of Lulu. I have seen first-hand how incredible your organisation is in placing abandoned children into their ‘forever’ families. The screening process, from start to finish, went so smoothly. I want to commend you, your team and the Social Worker, Brenda Cooper for the professional and loving approach throughout this journey. 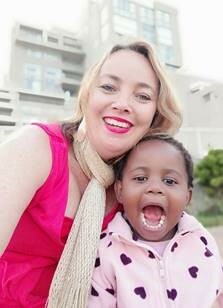 It really has made the transition of adoption an easy option for me as a single person and I would highly recommend anyone considering adopting a child, to go through iThemba Lethu. Lulu has blossomed over the last few weeks and she now sings to herself and we have many moments of laughter together. She is definitely a gift and I am so privileged to be given the opportunity to raise her. She has added so much joy into my life and I will forever be grateful to each one of you for all you did to bring us together. I am the Marketing and Fundraising Co-ordinator for iThemba Lethu. I am passionate about people, stories and fascinated by human courage, capacity and resilience!